The release is no longer a "35th Anniversary Edition" but the Blu-ray is still coming in early March. 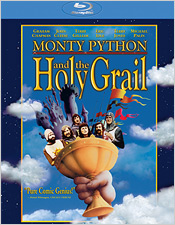 As previously reported, Sony will be releasing 'Monty Python and the Holy Grail' on Blu-ray on March 6. The Hugo-nominated classic is currently ranked #74 on IMDb.com's Top 250 and stars Graham Chapman, John Cleese, Eric Idle, Terry Gilliam, Terry Jones, and Michael Palin. The Blu-ray will include an Ultraviolet Digital Copy and will feature 1080p video, a Dolby TrueHD 5.1 soundtrack, and supplements include: Commentaries by Terry Gilliam & Terry Jones, plus general complaints and back-biting by John Cleese, Eric Idle & Michael Palin; Join Michael Palin and Terry Jones in their special documentary The Quest For The Holy Grail Locations; Monty Python And The Holy Grail In Lego! ; Japanese version; How To Use Your Coconuts (An Educational Film); BBC Film Night; Meanwhile, King Arthur & Sir Bedevere...; Elephant & Castle; Run Away! ; The Tale of Sir Robin; The Tale of Sir Lancelot; Three Mindless Sing-Alongs; Henry 4th; and Cast directory photo gallery. Blu-ray exclusives will include Terry Gilliam introduces his lost animation reel; Terry Jones introduces the outtakes; and The Holy Book of Days Second Screen application for iPad. You can find the latest specs for 'Monty Python and the Holy Grail: 35th Anniversary Edition' linked from our Blu-ray Release Schedule, where it's indexed under March 6.